Elkfest's big crowds have been an economic boon to neighborhood businesses — but have sparked complaints from some local residents. 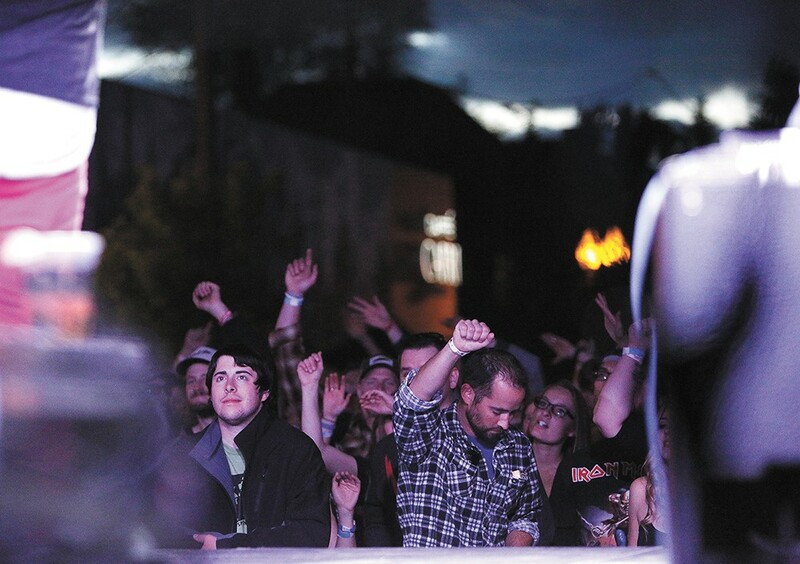 For 13 years, Marshall Powell, general manager of the Elk, has put on Elkfest, the annual music festival that draws thousands of fans and neighbors to the Browne's Addition neighborhood. But it was this year — the 14th — that Elkfest has run into trouble. It wasn't because of snafus with bands or vendors. It was because of the city's permitting process. Since 2012, the stage has been the exact same size in the exact same spot — but it was only this year that the city's fire marshal said the stage setup was breaking the fire code. But even after the Spokane Fire Department, with a nudge from City Council President Ben Stuckart, found rationale to let Elkfest continue as is, the event faced another setback: The city determined that Elkfest would be required to pay the cost of four Spokane police officers to provide additional security at the festival, at a cost of $4,500. For an event like Elkfest, it represents a major financial blow. "It's about 12 percent of our entire budget for our event," Powell says. "And the event's free." With the first day of the festival scheduled for June 10, Powell is appealing the city's decision. During the last six months, city departments have tried to hammer out a new special-events process to provide more simplicity, clarity and consistency for major events like Elkfest, Terrain and Hoopfest. But in the process, some like Powell and Stuckart have raised questions about whether the city is making it easier for events like Elkfest to happen — or whether they're throwing hurdles in the way. Since 2004, Elkfest has continued to grow, moving from a two-day event to a three-day event and drawing bigger and bigger crowds. But success comes with additional problems. "As it just kept getting bigger, it was just a matter of dealing with those logistics, of more people and more city attention," Powell says. By now, Powell has enough experience under his belt that the permitting process has become second nature. Elkfest has outlasted three different special-event coordinators at the city. But in the last few years, says Carly Cortright, the city's most recent special-event coordinator, the city has been trying to improve its confusing permitting process. An event like Bloomsday had to apply for separate permits through Riverfront Park, the Spokane Police Department and the Spokane Fire Department. "They are basically filling out an application three separate times and paying three separate fees," Cortright says. "We wanted to improve that." Spokane has moved toward centralizing the whole complicated process under the city's permitting center. But as a result of more communications between departments, events like Elkfest got more scrutiny. "We've come across inconsistencies in how we have dealt with events," Cortright says. "That's part of this event process — making sure we are being fair." Over the years, Elkfest's gradual, incremental growth had allowed it to skate by, Cortright says, despite potential issues. But this year, the city flagged a potential fire code violation: The stage blocked off the Fire Department's access through Cannon Street for several days at a time. "It has always been an event that's been unique," says SFD Fire Marshal Mike Miller says about Elkfest, "And not optimal for us." But while the Fire Department suggested alternate stage arrangements, Powell says, none of them were viable. Placing the stage with its back to the Elk or Italia Trattoria would undercut the exact businesses paying to put the event on. Holding the event in nearby Coeur d'Alene Park wouldn't work either. "We can't sell alcohol in Coeur d'Alene Park," Powell says. "And that means we can't make money." So Powell petitioned his elected representatives, like Stuckart, for help. Stuckart reached out to the fire chief. The fire marshal dug deeper into the code. "They found a loophole," Powell says. Cannon Street is short enough that, even while blocked by the Elkfest stage, fire trucks can still access each building. The three-story building nearest to the Elkfest stage was outfitted with sprinklers. Those facts gave the fire marshal room to be a little more flexible. "We can make it work. It's not optimal, but it is acceptable," Miller says. "I was able to use a little bit of latitude that the code allows me." To Cortright, it's an example of the way the city seeks to strike a balance between entertainment and public safety. But Stuckart, frustrated with the way the fire-code ruling was initially handled, suggests that a mentality at the city needs to change. He's been irritated with the fire marshal's decisions elsewhere, including the mandate to shut down the fire pit at Riverfront Park's ice ribbon, until safety upgrades could be installed. "It depends on if people think the world is black and white — or are there gray areas?" Stuckart says. "I think it's a people problem, versus a code problem. I think we need people who are problem solvers." After all, it's not just the fire code that has created problems for Elkfest. Powell has the printouts of last year's Police Department Compstat data in his hands. Compared to the week before and the week after, crime last year actually went down during Elkfest. That's one reason why he bristles at being asked to pay for four police officers, on top of his two private security officers, to be present at the event. Last year, the city requested Elkfest pay for the police, but didn't mandate it. This year, they're insisting on it. "We should have added police, probably several years ago," Cortright says. "We let it go longer than we should have. We probably should have stepped in sooner." It isn't just serious crime that the city is concerned with deterring, she points out. It's the nuisances. "We've seen an increase over the years of reports of lewd conduct. Neighbors reporting after the event of people urinating or defecating in their alleyways, of trampling their flowers, their yards. People just lose self-respect," Cortright says. "Last year we had a report from an attendee about the pervasive amount of pot smoke." Powell sits at a table toward the back of the Spokane City Council briefing room Thursday, observing as city administrators, police officers and councilmembers debate the rules governing when an event has to pay for extra police officers and when it doesn't. For example, the music and art festival Terrain has an estimated 10,000 people walk through its doors — double the approximate size of Elkfest — but the group has never had to pay for extra police presence. There are a lot of factors the Police Department considers, including the location and prior history of the event. "We know that some musical events actually require no police attention whatsoever," Spokane Police Maj. Eric Olsen says. "Other musical events will require a heavy police presence, because of the type of audience the event attracts and the type of behavior the musical event incurs." In other words, in an example that Councilwoman Karen Stratton offered, an Ozzy Osbourne concert might require a bit more police presence than a John Denver concert. But if the standards aren't clear, objective and content-neutral, the city of Spokane could face legal problems. In 1992, the U.S. Supreme Court ruled that Forsyth County, Georgia, was violating the First Amendment by charging different permit fees to different groups, instead of establishing clear standards unconnected to political views or anticipated audience reaction. Right now, Stuckart sees considerable inconsistencies, noting that events deemed to be "regionally significant" receive a discount. Bloomsday and Hoopfest, for example, are only charged for 60 percent of their police presence — the Police Department pays for the other 40 percent out of the SPD budget. The Lilac Parade isn't charged anything. "It's unfair to say that the Lilac Parade is 'regionally significant,' so they don't have to pay," Stuckart says. Massive, already-successful events don't need as much help, he argues. It's the smaller ones that still have a positive impact on the neighborhood that could be harmed. "We don't want to overprice them out of their community," Stuckart says. "To charge $5,000 for a police service can be a burden on them so they don't put on the event anymore." He asks the Police Department how much the council needs to add to their budget to prevent the rules from killing events. An earlier version of this article reported that Bloomsday and Hoopfest are "only charged for 40 percent of their police presence" and that the Spokane Police Department pays for the other 60 percent. Those figures were backwards and have since been switched. The original print version of this article was headlined "The Fireman, the Cop and the Elk"